Shooting Star Medals are available in 1-3/4" and 2-1/2" size. These medals feature a 3 dimensional scene framed by a shooting star border on the front. The back of the medal can be engraved to personalize for your event or team members. Shooting Star Medals are available in gold, silver and bronze. 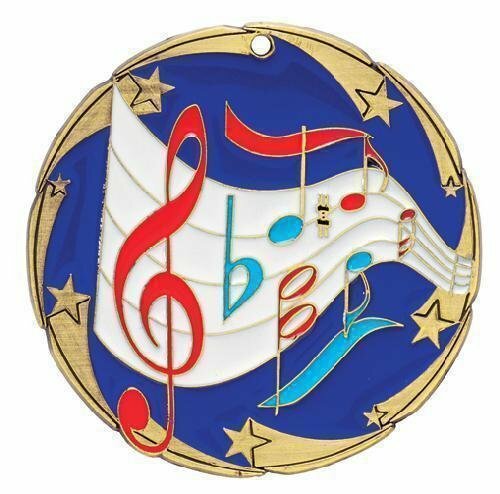 Shooting stars make their way around the outer edge of this color music medal to add a dynamic look. Brightly colored musical notes appear to move across the backdrop of white sheet music giving it a refreshing new look. These medals are 2 1/2" in diameter and are available in gold, silver, or bronze. Plenty of room on the back for engraving. Just add a ribbon to complete this award. Color and academic icons are the featured items on this Color Tek Art award. 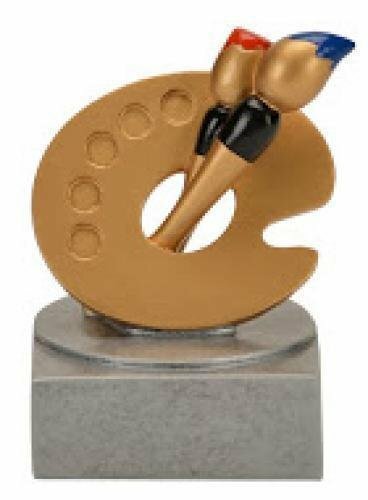 A gold painters pallet along with two paint brushes with tip of red and blue paint are the icons on this award. 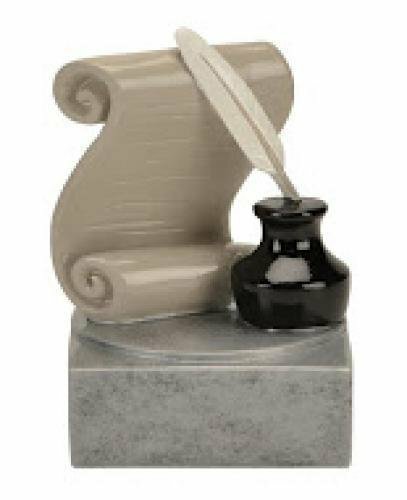 The award stands 4" tall and the pewter finish base has plenty of room for whatever your personalization needs might be. This is the perfect award for your next art based event. Production lead time for this award is 7 days. This award has a minimum order quantity of 25. 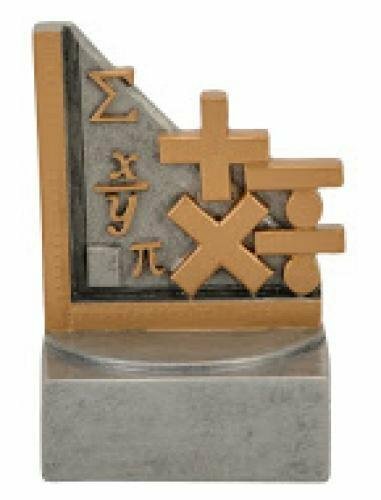 This award must be ordered in quantity increments of 5. You have lots of choices with these Legend Music Awards. 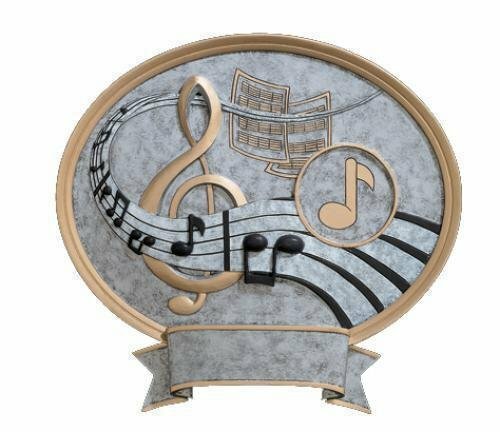 The music icons in the award are raised providing a 3-dimensional look. A variety of different sized and colored musical notes are shown floating across the chord progressions to complete the scene. Additionally, you can also choose a 2" Mylar to highlight a specific musical achievement. These oval awards are available in your choice of two sizes, 6 1/2" X 6" and 8 1/2" X 8". A large area at the bottom of the award can accommodate your personalization needs while the gold and pewter finish complement the look of the award. This item can either be hung on a wall or placed on a desk using the included stand. This Music Mega Medal is perfect for your next awards presentation. 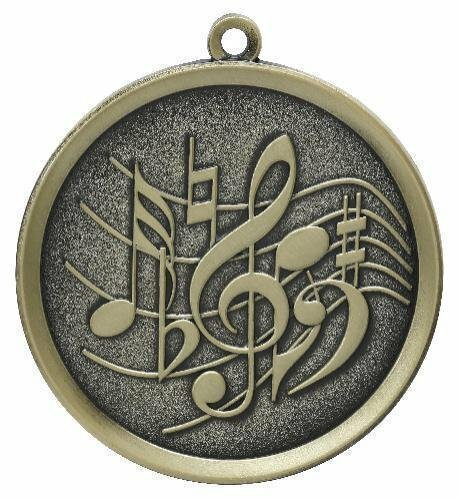 Music notes and scales fills the front of this 2 1/4" in diameter medal. In addition to many other sports or activities these medal come in your choice of gold, silver or bronze finish. The back of the medal has more than enough room for all of your personalization needs. All you need to do is pick a ribbon and you are all set to go! Color and elegance are brought to life with this Music Activity Insert Award. The center of the award is highlight by a full color 3D action lenticular activity insert card for music. The music notes move across the scales for a look like no other. 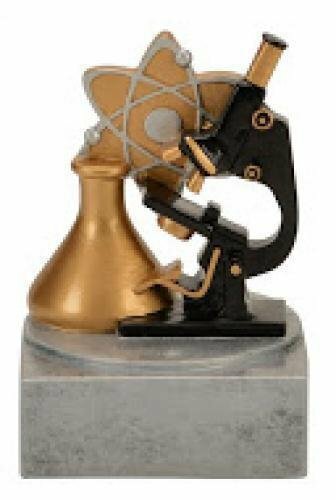 this award trophy measures 11 1/4" tall and has plenty of room for whatever your personalization needs might be. After you have added this item to your cart, you can modify any of the parts for any sporting or academic activity. Your recipient wont believe their eyes when they see this award trophy! Music Activity Insert 11 1/4"